This has to be up there in our list of busiest months of our lives which is why the update is so late. Jane spent much of the month packing up our belongings into boxes and even more boxes. After 17 years in the current Pig Yard (yes there's another Pig Yard in development) it has been a traumatic month with a few highs and many lows. Despite everything that has been going on we tried to maintain a semblance of order and managed to keep ourselves entertained. Steve's been working on a project for the past 12 months to help local communities develop their own web sites. The project is supported by Northamptonshire Libraries and they have done most of the training. 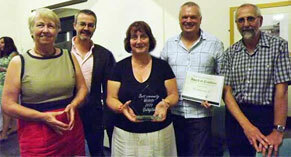 At the end of the year there was a prize giving evening for the best web community site in the county. He had no intention of getting into the publicity pictures at the end but in a moment of weakness he happened to be standing next to the overall winners – what a fool. It will be sad to leave the project behind when we move and he's not sure he would want to do the same thing in Lincolnshire so we shall wait and see what opportunities might arise. 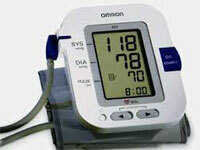 Before he retired Steve was always working under pressure and as a result his blood pressure was higher than the ideal. Since retiring his exercise regime and more relaxed lifestyle kept his blood pressure at a reasonable level. Over the past few weeks he's been experiencing problems with his right eye with a shadow appearing in the lower quarter. He had something similar in 2010 and this was put down to a temporary blocked artery in the eye. After a visit to the doctor he was sent to Eye Casualty where the consultant ophthalmologist diagnosed a retinal vein occlusion. He attributes this to his high blood pressure and therefore have arranged to visit the doctor again to see if he can get some pills to get it down. 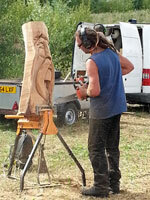 It has been two years since we went to the Woodworks Festival at Marston Vale in Bedfordshire. We were introduced to it by our friends Kate and Martin now living in Bulgaria. The festival focuses on country crafts, natural England and forestry. The last time we visited it was very wet and there weren’t many opportunities to get away from the music tent to see other activities because it was tipping down with rain. Thankfully the weather was reasonable and we went round all the stalls and watched some excellent, informative demonstrations on training horses, using gun dogs, ferrets and falcons to hunt rabbits and carving with chainsaws. We finished the afternoon listening to Berkhampstead Ukulele Random Players or BURP who played an eclectic repertoire that normally wouldn’t have been on our playlist but certainly amused us. We needed something to lift us out of the numb mood we were in so on a dull Monday, late afternoon we decided to go and see About Time. It’s an excellent feel-good film with the romantic skills of Richard Curtis at the helm. There’s no better film for us than one that combines pathos, humour and romance. 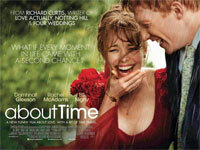 About Time has all three in carefully managed proportions. We laughed, cried and came out feeling all warm and cuddly. The basic plot is about a young man who learns from his father that he can travel back in his own time-line and rerun elements of his life. We’ve all had those moments in life when we wish we could repeat a personal interaction so that we made the most of it. This power enables him to win the heart of the girl/woman he falls in love with. Thereafter he struggles to maintain his life situation so that all of his family remain happy. There are limitations on what he can do and how far he can go back but these don’t become apparent until later in the film. If you are in a relationship and want to remind yourself why life is so much better with someone than the alternative then this is a “must see” film. The house project is making good progress and our foundations were in place ready for the timber frame to be installed. In the background is Dave and Lucie’s frame nearly complete. Our construction started on Tuesday 17th September. 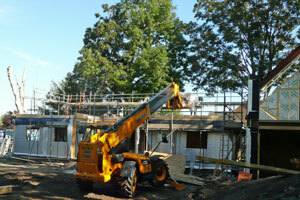 We’re hoping the frame will be completed within two weeks before the worst of the autumn weather hits the site. Once the frame is up then work can start on the inside to get plumbing, wiring, etc. installed. It is important that our windows are delivered in a timely way so that the building can be weather proofed as soon as possible. 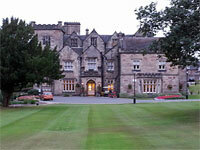 We stayed at Breadsall Priory, a very up market hotel just north of Derby. The drinks and meals in the bar were horrendously expensive and the food even more so. Steve had fish and chips which cost £14.50 and it was no better than you’d find wrapped in yesterday’s newspaper. So we decided to go back to a pub we spotted earlier. After travelling down narrow lanes in the pouring rain we pulled up in the car park and made our way inside to a scene from Deliverance. Jane went to the bar and ordered our drinks and then asked for the menu only to be told that they stopped taking orders at 8pm – the time? 8.02, We kid you not. No wonder pubs are closing across the country. We were up in Lincolnshire for a site meeting. Afterwards we went to see a number of potential temporary homes just in case our house sale went through. 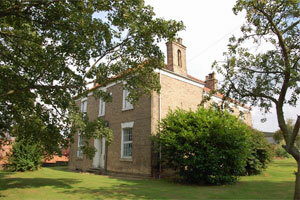 During the morning we had several calls from our solicitor negotiating a completion date. To cut a long story short, after much brinkmanship on our buyers part we agreed a completion date of 11th October and the contract exchange took place at 11.15 on Wednesday 18th September. 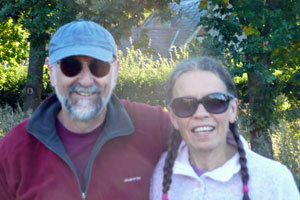 We, particularly Jane, are busy organising our move and contacting all the utility companies, etc. There is a long checklist to be run through. With our move supposed to take place in August we didn’t register for the Cycle4Cynthia sponsored cycle but as things turned out we were here. We’ve been doing this cycle for 9 years and it’s a shame this will be our last. This time we undertook the 25 mile circuit rather than the 50 miles because we hadn’t had time to get enough cycle practice to make sure we were fit for the 50 miles. The weather was the very best ever (last year it was cold and wet for most of the cycle) and we soon shed our pullovers and did most of the cycle in our T-shirts. The camaraderie of so many people with a shared aim is brilliant although some cyclists took it all a bit too seriously and whizz passed us at over 20mph whilst we plod along at 10mph. 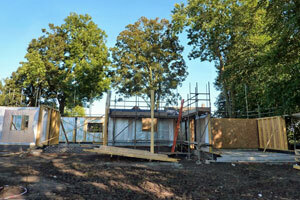 Our house is starting to take shape with some of the ground floor panels erected. It seems they got this far and then ran out of materials so the workers were called off-site onto another project. We’ve been assured that the rest of the panels will be delivered on Tuesday 24th September. Thankfully Dave & Lucie will be there and can check to see if they turn up. We’re hoping that the build will be completed by the middle of October. On the way back we visited the site where progress is being made. On the right hand side the garage is nearly complete and the studio window frame is in place. The builders were installing the first floor and hopefully they will soon be constructing the upper floor wall panels and the steel girders for the front atrium. With decent weather it should be finished soon. 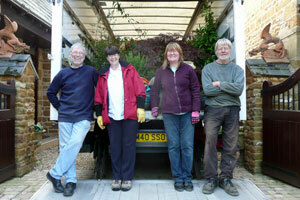 To keep the costs of removals down we decided that we would move all the garden stuff – pot plants, lawnmowers, tools, etc. ourselves. A friend in the village offered to borrow a lorry and to drive it up there for us. With the help of our very good friends (pictured) we filled the lorry and our trailer in just over 2 hours before stopping for coffee. Thankfully our friends had volunteered to travel up to help us unload, particularly as Jane had torn a back muscle within the first half hour and was effectively out of the big lift. We then faced the long journey (130 miles) up to Wrawby where we will be living for the next 6 months. On arrival it took less than half an hour to unload and store away in the very large garages before walking over to the pub for a well deserved drink and lunch. Without too much delay we took Sue & Graham to the building site for the first time and headed home with Steve struggling with sleep as the rest of the car got their heads down. Are we getting too old for this?